Thank you all for what you are doing on behalf of our organization and members. You may be sure you are making an impact on the lives not only of our veterans but also our active duty troops stateside and those deployed in harms way. Many of you have contributed individually, as posts and districts for which I am extremely grateful. We bounced a number of ideas for fundraisers and I hope you are able to execute your plans. But, in the meantime there is a need for an infusion of cash. The first quarter of 2019 will see me campaigning in Virginia, Louisiana, Arkansas during January, followed by Florida, North Carolina, Tennessee during February and then in March I will participate in the National Council of Administration meeting and National Legislative Conference in Washington DC the first week followed by the Mid Winter meeting of the Department of Kentucky. April I will be in Alabama. May I will be in South Carolina. In June I will attend Department Conventions in Mississippi, Texas, Oklahoma and Georgia. And, now to the subject at hand, the fundraiser. Again, thank you for your verbal commitment to support this effort. I have attached a flyer you should be able to print from your computer. Please tell me if you can't. The Chairman for my fundraising efforts is Past State All American Commander, Richard Attaway. The treasurer for my campaign is VFW Post 12002 Quartermaster Jim Davis. Lipphardt CIC Campaign is an LLC. Money from the Raffle will be deposited in the Lipphardt CIC Campaign account and will not be co-mingled with VFW funds. You will be contacted by Richard in the next several days. 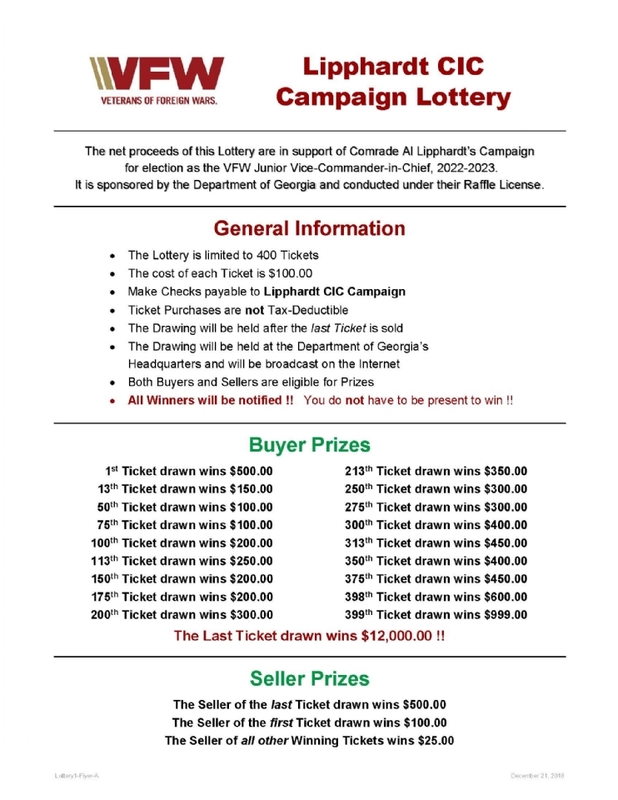 There is a procedure in place to process the distribution and sale of the raffle tickets. As you will see on the attached flyer this is a $40,000 effort with over $18,000 going to payouts. You should be aware that I intend to do a larger fundraiser (raffle) in 2020 that will include dinner, silent auction, music and dancing and adult beverages. Thanks again to each and every one of you and especially to Richard Attaway and Jim Davis for stepping up to make this raffle happen. My availability is limited in January and much of February, but if you can use me Monday, Tuesday or Wednesday of a week, don't hesitate to let me know. "Believe In What You Do - Do What You Believe In"